In musical instrument construction there is a long tradition of honouring one’s great and influential colleagues by making copies of their instruments so that their work may live on. In the guitar world there are countless examples of copies of guitars built by Torres, Ramirez or Hauser. Every guitar builder, who is lucky enough to have held an original guitar built by one of these or any other great masters, knows what an inspiration it can be and how great the wish to emulate them is. 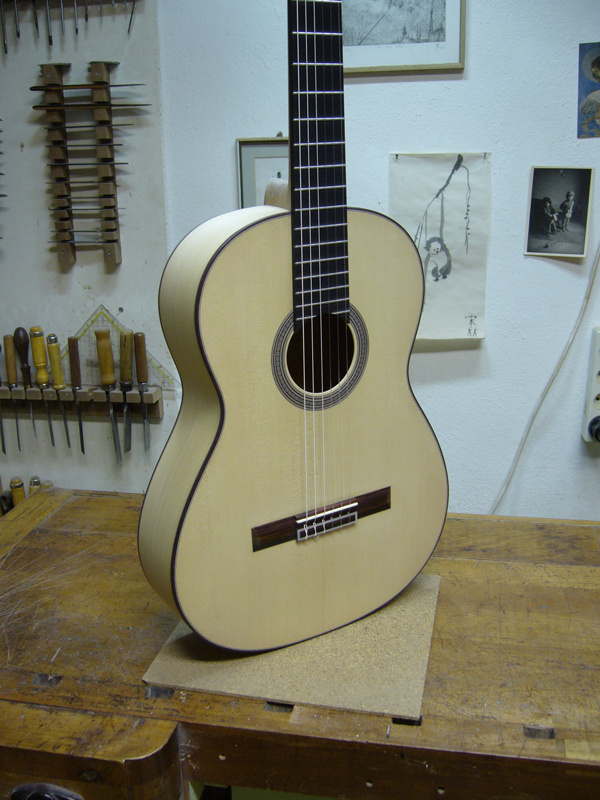 Rolf Eichinger, who died in 2009 in Salobreña near Granada, was doubtless one of the best guitar makers of his time. He was my teacher and friend and to honour him I am now offering a“ Rolf Eichinger“ model. Keeping to the copy-making tradition, the dimensions, aesthetics and even order of build of this model will remain true to his. Furthermore I will use his construction methods, which come from the guitar building tradition of southern Spain and have a decisive influence on the sound. Rolf Eichinger was born on the 10th September 1944 in Stuttgart. There as a young man he studied Industrial Design but gradually became more interested in guitar playing. Soon he was an excellent guitarist and after 1970 he worked for a few years as a guitar teacher in the Musikschule Stuttgart. During extended travels and stays in Spain, particularly Andulacia, he learned the language and became friends with some of the best guitar builders in Granada e.g. Antonio Marin Montero and Jose Lopez Bellido. In those days it was much harder to get hold of decent instruments so Rolf always brought guitars back to Germany for his students. The demand soon became so great that he decided to open a shop. In 1978 he opened "Die Zupfgeige“, which within a few years was known to have one of the widest selections and some of the greatest guitar-expertise in Europe. By this time he had already found his love of guitar building and he started his first workshop in the Zupfgeige, which became a sort of holy place for aspiring guitar builders. Spain is the motherland modern guitar building. 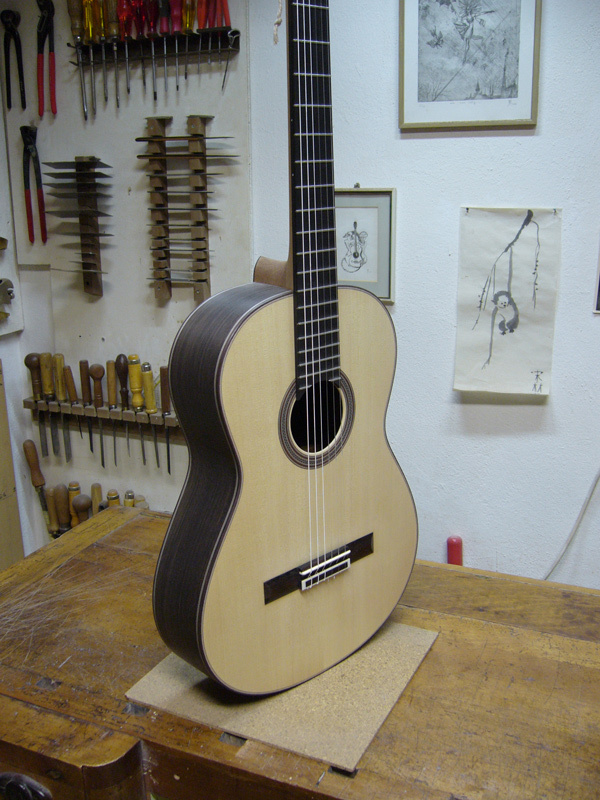 In southern Spain in particular there is still a living handicraft tradition out of which refined methods of guitar construction developed over many generations. Rolf was fascinated by this and for many months had the opportunity to work in various workshops in Granada. As a result he brought priceless information back to Karlsruhe. 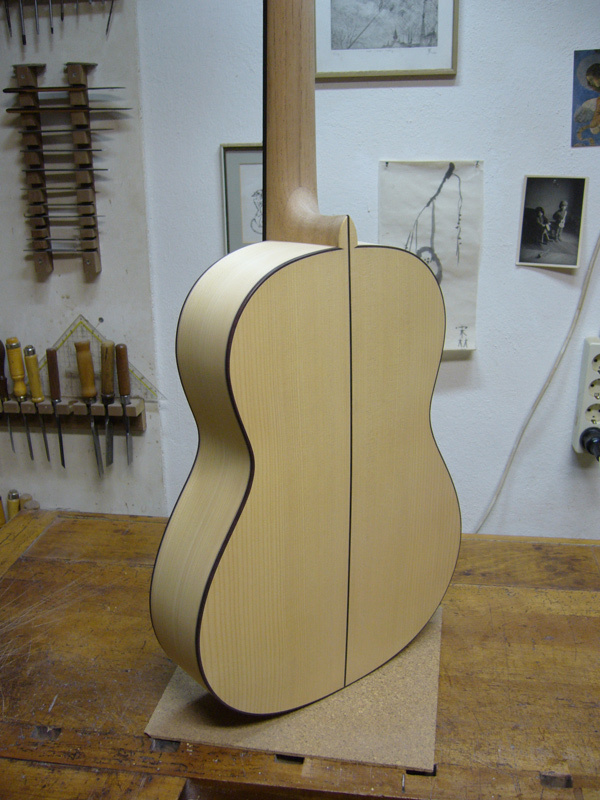 In 1991 Rolf handed over the Zupfgeige to his long-time colleague Matthias Adler so that he could dedicate himself to guitar building. He moved to Pfinztal/Berghausen near Karlsruhe where he established his next workshop. In 1997 he decided to emigrate to Granada where he thought the greatest guitar builders of the time lived and from where drew the inspiration for his own work. Rolf was pivotal in the development of the careers of many young guitar builders there, as he was for many others during his time in Germany. Due to his extensive knowledge of the Spanish guitar building tradition he was regularly consulted and highly esteemed by well established colleagues from all over. In 2007 he became seriously ill with cancer and moved temporarily to Salobreña on the south coast of Andalucia to recover. There on the 18th September 2009 he died. During his time as a guitar builder he built about 300 guitars. I met Rolf in 1988. I had just finished my first year of trying to make guitars on my own and I was on the lookout for information. I had taken part in a lute construction course with Robert Lundberg, spent a few months doing in internship with the company Hoyer and had established my first workshop in Freiburg. Back then to play on one of Rolf‘s amazing guitars was a revelation. It was to my good fortune that we immediately got on well with each other. He took me under his guitar-building-wing and became my mentor. From then on I went religiously every few weeks to Karlsruhe to show Rolf my work. Many who were close to him know that he was not always easy to be around. As a perfectionist he scrutinised every tiny detail and his criticism could be terrible. But those who were ready to take the criticism were rewarded with knowledge, which would have taken years to accumulate by oneself. Thanks to his help my results quickly improved and from 1990 he sold my guitars in his shop. He taught me among other things the laborious art of french polishing. Some of Rolf‘s instruments of this time were polished by me. In 1995 he offered me to work together with him in the “Werkstatt Eichinger-Gitarren“. This collaboration gave me a much more detailed insight into his method and construction techniques. We worked together for about two years until Rolf decided to move to Granada. I visited him there many times and he me when he came to Germany. In 2008 Rolf‘s condition deteriorated to the point that he could no longer do the more exhausting work and he asked me if I could help him with it. This was a great honour for me. 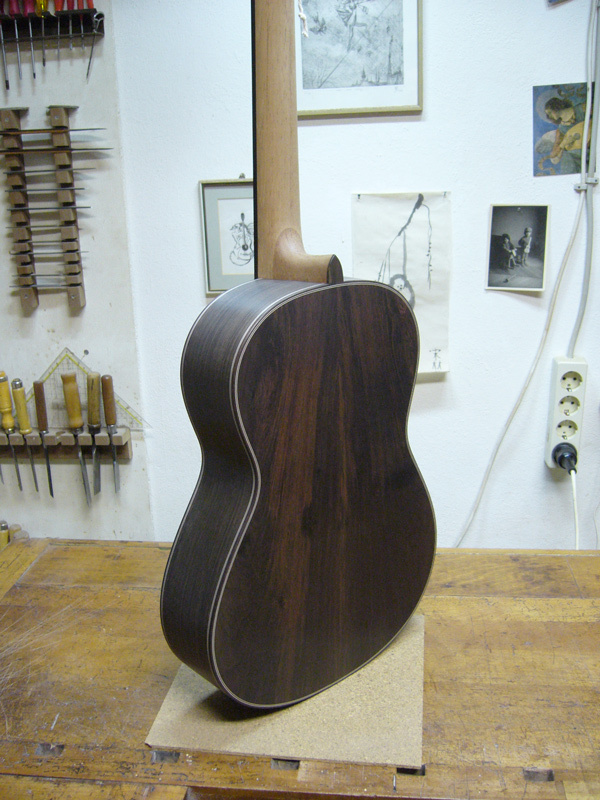 We began to send his guitars in various stages of construction from Spain to Germany and back again. Also a new opening of the “Werkstatt Eichinger-Gitarren“ was planned but never came to fruition. Until one week before his death Rolf tried to work in his workshop every day and was full of plans for new instruments right up to the end. With the permission of his widow and the clients, I finished his last two half-built guitars and even then managed to learn a great deal from him. My “Rolf Eichinger“ model will remain faithful to his 64 cm scale length. He particularly liked this model. It was very successful and had a beautiful sound. The variety of tone colours capable of being produced was outstanding and despite the short scale length the guitars were loud and projected well. The soundboard and all other construction details will correspond to Rolf‘s plans, as will the appearance and aesthetics. This includes of course the body shape and the form of the head and rosette. Other body sizes and scale lengths are available on request.